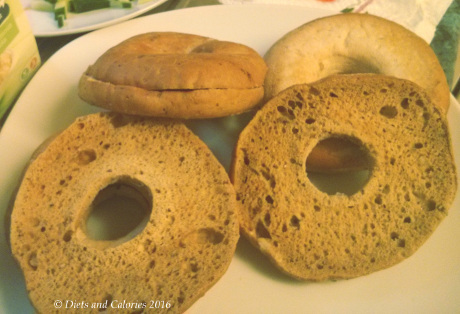 If you’re bored with regular sized bagels or are looking for something a bit lighter, there are several alternatives. For example you could choose mini bagels or bagel thins – see previous reviews. And here’s another option from the New York Bakery Co. called Bagel Sandwich Thins. They’re available in two varieties: plain white or seeded. Both have under 130 calories. 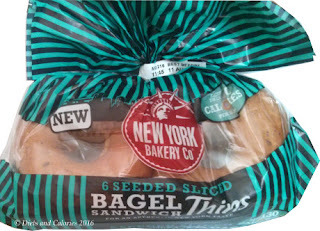 Each pack of Bagel Sandwich Thins contains 6 x pre-sliced bagels. This is really handy if, like me, you freeze this type of product to keep it fresh. When you take them out of the freezer they’re easy to prize apart and you’re ready to go. These aren’t just a slimmer substitute to regular sized bagels as they have a different texture. I think this is simply because they are so thin and lack the doughiness. They’re especially good when toasted but, like the Kingsmill Bagel Thins, they toast quickly and become very hot. I generally use this type of bread as a base for open sandwiches. 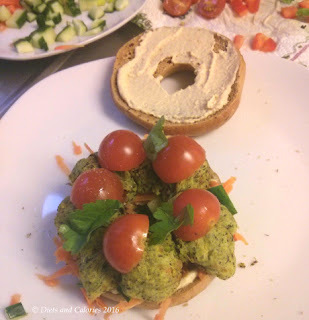 The photo below is a spinach falafel cut into slices with a hummus base and piled high with salad. Of course most of it falls off when picked up to eat! 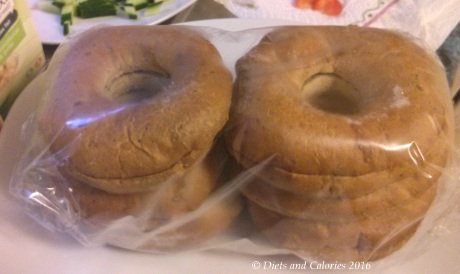 You can purchase these bagels in the usual supermarkets. Ingredients: Wheat Flour (with added Calcium Carbonate, Iron, Thiamin, Niacin), Water, Seeds (3%) (Linseed, Sunflower Seeds, Millet Seeds, Poppy Seeds), Sugar, Rapeseed Oil, Yeast, Caramelised Sugar, Wheat Bran, Oat Flakes, Salt, Wheat Gluten, Vinegar, Preservative (Calcium Propionate), Vegetable Proteins, Sunflower Oil, Flour Treatment Agent (Ascorbic Acid), Dextrose, Maltodextrin, Starch. Suitable for Vegetarians; Suitable for Vegans. Nutrition Information per bagel: 129 Calories, 1.5g fat, 0.2g saturated fat, 23.4g carbs, 2.5g sugars, 1.7g fibre,4.5g protein, 0.4g salt. Medium Sugar, Medium Fat, Low Saturated fat, Low salt.